When China started tightening its capital controls on both its upper-crust investors and its public and private companies back in 2016, we anticipated that the bubble in popular urban markets (markets like London, New York City, Sydney, Hong Kong and Vancouver) was officially doomed to burst in the not-too-distant future. And as a flood of stories over the past year have confirmed, once the foreign (mostly Chinese) bid was withdrawn, property prices started to drop. It’s happening in Australia (and especially in Melbourne and Sydney), it’s happening in New York, it’s happening in London and – as we’ve catalogued over the past few quarters, it’s happening in Vancouver, which for a while held the ignominious title of world’s most overpriced housing market. After a chasm opened up between bids and asks in the Vancouver housing market last year, the halt in home sales has finally started filtering through to prices as reluctant sellers finally cave and cut their prices. According to data from the Real Estate Board of Greater Vancouver, the city’s composite home price (which incorporates prices of houses, condominiums and townhouses) fell 4.5% in January from a year earlier to C$1.02 million ($780,000), the biggest decline since May 2013 and down about 8% from the June 2018 peak. As we noted above, the drop in prices follows a decline in sales – the biggest drop in two decades – that many have attributed to new taxes, higher interest rates and a crackdown on dark money flowing into the Vancouver area real estate market. Meanwhile, outbound investment, Bloomberg confirms, has slumped. Ultimately, the Fed-led global monetary stimulus sent prices in these markets roaring to dizzying new highs during the QE era. But now that the Fed is reining in its balance sheet (and until signaling a “pause”, had been raising interest rates, too) prices that rose on the back of a tidal wave of liquidity are now coming back down. “Today’s market conditions are largely the result of the mortgage stress test that the federal government imposed at the beginning of last year,” Phil Moore, the realtor group’s president said in a statement Monday. “Vancouver real estate was one of the largest benefactors,” of that stimulus, says Steve Saretsky, a Vancouver realtor and author of a local real estate blog. “It may be simple to summarize the slowdown as a few local tax policies and tightening of lending standards, but in reality it’s much more complicated,” says Saretsky, who’s now trying to explain the darkening macro picture in a market where many locals have long considered home price appreciation unstoppable. The very top end of the market has been the hardest hit: Prices in tony West Vancouver have fallen 14% yoy as of January. And as one real estate agent confirmed to BBG, now that foreign buyers are pulling back, sellers who were once asking for C$12 million or C$13 million are asking for…significantly less. Dinani, who’s been in the business for 14 years, says there are fewer speculative investors, and foreign buyers have really pulled back. “And what local buyer has C$6 million, C$7 million to put towards a home?” he said. Still, with Vancouver’s housing market extremely unaffordable when benchmarked to local wages, no local buyers have the money for these homes. Which can mean only one thing: Prices have further to fall before the equilibrium point is found. This entry was posted in Housing Market and tagged Vancouver on February 6, 2019 by Bone Fish. Thanks to an influx of demand from Chinese nationals and other foreigners, Vancouver’s housing market soared in the post-crisis years, with prices more than doubling to levels that were clearly unsustainable, cementing the Pacific Northwest metropolis’ status as the most unaffordable housing market in North America. But the torrid growth ground to a halt earlier this year as home sales plummeted, along with construction of new homes and apartments. The typical single-family home in Vancouver costs more than C$1.5 million ($1.15 million) – roughly 20x the median household income. In an effort to let some air out of one of the continent’s most egregious property bubbles, British Columbia’s government has announced an unprecedented crackdown on money laundering in Vancouver’s property market in an attempt to stop a housing-market collapse from taking the city’s GDP with it. The initiative, launched by Attorney General Daid Eby, seeks to create more transparency to expose all the “numbered corporations” (often used as fronts for foreign investors) buying property in Vancouver. The probe will also examine horse-racing and luxury car sales. Attorney General David Eby said that his office is launching an independent review into potential money laundering in real estate, horse-racing and luxury car sales. The review comes in response to recommendations from a previous review into money laundering in the province’s casinos. In addition, Finance Minister Carole James has appointed an expert panel to look directly at money laundering in the housing sector. Both probes will be done by March. Still, the success of these initiative will be constrained by the fact that they’re only meant to learn the mechanics of how money is laundered via the Vancouver property market, and then make recommendations about how to stop it. Indeed, it’s entirely possible that, by the time anything is actually done, criminals will have changed their strategies or shifted to different markets. Meanwhile, a study by Transparency International found that it’s impossible to identify the owners of nearly half of the most expensive properties in Vancouver. However, it’s only a matter of ti me before prices begin their dramatic descent as sellers finally capitulate and drop their ask down to the highest bid. This entry was posted in Housing Market and tagged Vancouver, Vancouver Housing on September 30, 2018 by Bone Fish. A secret strategy briefing for Canada Revenue Agency auditors has revealed plans to crack down on real estate tax cheats in Vancouver, with 50 auditors being assigned to investigate purchases funded by unreported foreign income. Presentation notes for the seminar, delivered to auditors on June 2 and leaked to the South China Morning Post, show that only one successful audit of worldwide income was conducted in British Columbia in the past year, in spite of Vancouver’s reputation as a hotspot for immigrant “astronaut families” whose breadwinners often work in mainland China and Hong Kong. 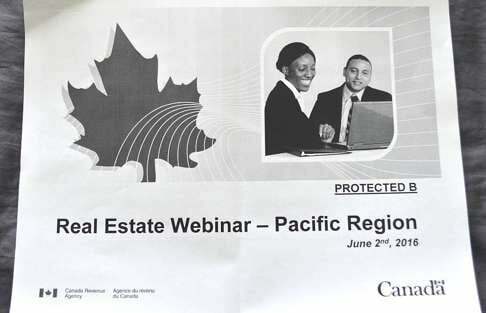 The plans, which come amid a furore over the role of Chinese money in Vancouver’s runaway housing market, were provided by a Canada Revenue Agency employee who attended the June 2 briefing. The briefing is identified as a “protected B” confidential document on the cover. But the employee feared the sweep would prove inadequate. “Sure, they’ve upped the numbers because it’s hitting the papers,” they said. But on average, they estimated, each redeployed income auditor would only be able to conduct 10 to 12 audits per year – about 500 or 600 in total. “This is nothing,” compared to the likely scale of the cheating, they said. That estimate is in keeping with the briefing text which says the crackdown will “review the top 500 highest risk files within our region”. 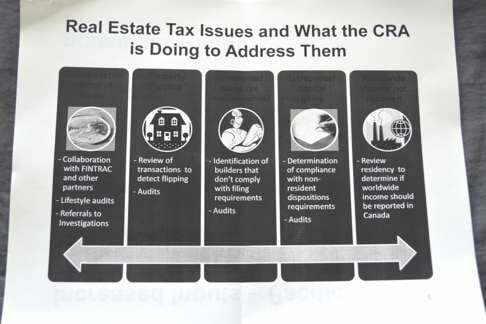 The briefing lists four areas being targeted for audit under the CRA’s “real estate projects”, launched in response to “significant media attention”: unreported worldwide income, property “flipping”, under-reporting of capital gains from home sales, and under-reporting of Goods and Services Tax (GST) on sales of new homes. 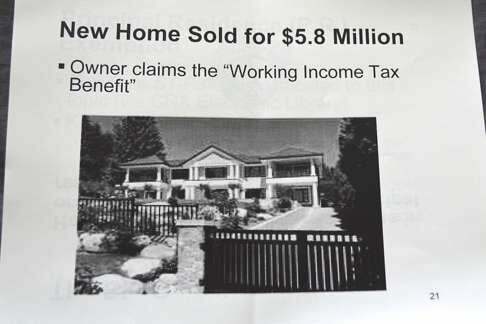 The presentation includes a photo of a luxury home supposedly bought for C$5.8million whose owner claimed the “working income tax benefit” for low earners. It also lists the tuition fees of Vancouver private schools. Property flippers who swiftly resell homes for profit will meanwhile be audited to see if their properties truly qualify for exemption from capital gains tax, granted to people selling their principal residence. 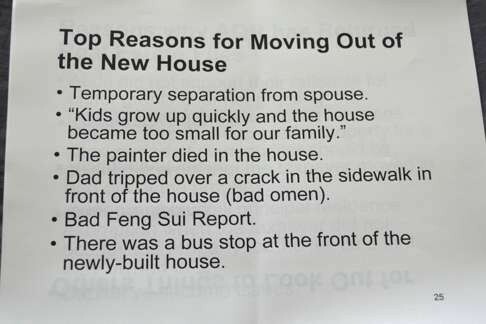 The briefing describes various excuses given by owners who moved out of newly purchased homes, including a negative feng shui report, the “bad omen” of tripping over a crack in the sidewalk, and a painter dying in the home. It cites the highly publicized case of a well-kept 20-year-old, C$6million mansion that was simply torn down after being bought, prompting community outrage. The briefing does not say the owners of this home, or the $5.8 million home, are tax cheats and nor does the SCMP suggest so. The CRA employee said the briefing, which was streamed online, was delivered by CRA’s Pacific region business intelligence director, Mal Gill. Gill declined to discuss the briefing. “I cannot confirm anything to you,” he said, referring the SCMP to a CRA communications manager. However, she said real estate transactions in Toronto have been the subject of greater scrutiny, for some years. “More recently, the CRA has been actively monitoring and auditing real estate transactions in British Columbia,” she said. “For the year ending March 31, 2016, the CRA completed 2,203 files [in BC and Ontario] related to real estate,” she said. 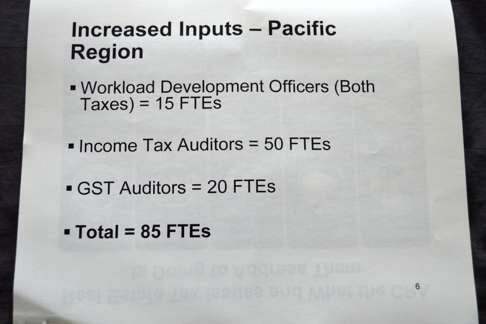 In addition to the 50 redeployed income auditors, the leaked briefing says CRA is assigning 20 GST auditors and 15 other staff to the real estate project in BC. The employee said they were surprised to discover that only one successful audit of global income had been conducted in BC in the year to March 31. “That’s the ludicrousness of this. I was shocked when I saw this, and they only got C$27,000 in tax revenue out of it,” they said. Census data from 2011 has previously shown that 25,000 households in the City of Vancouver spent more on their housing costs than their entire declared income, with these representing 9.5 per cent of all households. But far from being impoverished, such households were concentrated in some of the city’s most expensive neighborhoods, where homes sell for multi-million-dollar prices. The source suggested CRA bureaucrats previously feared being labelled racist if they targeted low-income declarers buying real estate “because the vast majority of these cases, involving high real estate values, involve mainland Chinese”. The crackdown was not intended for public knowledge, and instead was to satisfy “people from high up” in the CRA and government who wanted to know “what are you guys doing about this…there’s stuff hitting the papers every day”, the source said. Yet the briefing says the crackdown “will not address the major concerns about affordability of real estate”. 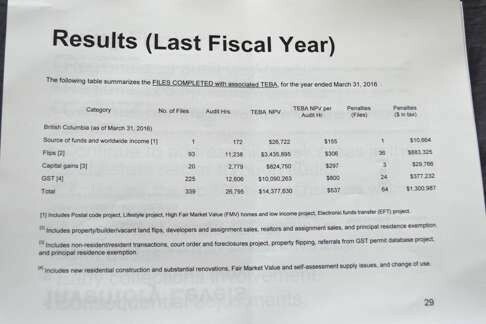 The leaked documents show that in in addition to the single audit on global income in the last fiscal year, CRA in BC conducted 93 successful audits on property flips, 20 on capital gains tax and 225 on under-reported GST. The audits yielded C$14.4 million in new tax, of which C$10million was GST. There was C$1.3 million in fines. As of April 29, there were 40 audits of global income under way, 205 related to flipping, 34 related to capital gains and 428 related to GST. The average Vancouver house price now sits around C$1.75million for the metropolitan region, while the Real Estate Board of Greater Vancouver’s “benchmark” price for all residential properties is C$889,100, a 30 per cent increase over the past year. However, incomes remain among the lowest in Canada, making Vancouver one of the world’s most un-affordable cities . The CRA responds here. No corrections have been made to this story as a result. This entry was posted in Housing Market, Luxury Homes, Luxury Housing, Real Estate, Uncategorized and tagged British Columbia, Canada, China, housing market, taxes, Vancouver on July 25, 2016 by Bone Fish. A recent poll found that two-thirds of metropolitan Vancouver residents believe “foreigners investing” is a main cause of high housing costs, and 70 per cent said the government should work to improve affordability. 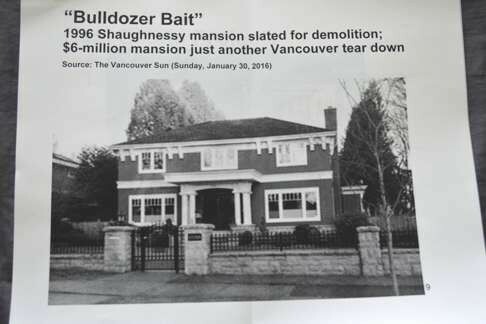 One month ago, when describing the latest in an endless series of Vancouver real estate horror stories, in this case an abandoned, rotting home (which is currently listed for a modest $7.2 million), we explained the simple money-laundering dynamic involving Chinese “investors” as follows. Chinese investors smuggle out millions in embezzled cash, hot money or perfectly legal funds, bypassing the $50,000/year limit in legal capital outflows. They make “all cash” purchases, usually sight unseen, using third parties intermediaries to preserve their anonymity, or directly in person, in cities like Vancouver, New York, London or San Francisco. The house becomes a new “Swiss bank account”, providing the promise of an anonymous store of value and retaining the cash equivalent value of the original capital outflow. The Post article, however, is not about the use of Vancouver (or NYC, or SF, or London) real estate as the end target of China’s hot money outflows – by now most are aware what’s going on. It focuses, instead, on those who make the wholesale selling of Vancouver real estate to Chinese tycoons who are bidding up real estate in this western Canadian city to a point where virtually no domestic buyer can afford it, and specifically the job that unlicensed “wholesalers” do in spurring and accelerating what is currently the world’s biggest housing bubble. A bubble which, the wholesalers themselves admit, will inevitably crash in spectacular fashion. This is the of about Amanda, who was profiled yesterday in a National Post article showing how a “Former ‘wholesaler’ reveals hidden dark side of Vancouver’s red-hot real estate market.” Amanda quit her job allegely for moral reasons; we are confident 10 people promptly filled her shoes. Vancouver’s real estate market has been very good to Amanda. She’s not a licensed realtor, but buying and selling property is her full-time job. She started about eight years ago as an unlicensed “wholesaler” in Vancouver. She would approach homeowners and make unsolicited offers for private cash deals. Amanda made a 10-per-cent fee on each purchase by immediately assigning the contract to a background investor. It is seen as the lowest job in property investment, but it is low risk and very profitable. Amanda has done so well that she now owns two homes in Vancouver and develops property in the U.S.
Unlicensed wholesaling is an illicit and predatory business that is quickly growing in Metro Vancouver because enforcement is virtually non-existent. It’s similar to a tactic currently being examined by B.C. real estate authorities known as “assignment flipping,” which involves legally but secretly trading homes on paper to enrich realtors and circles of investors. However, unlicensed wholesaling is completely unregulated. Amanda estimates hundreds of wholesalers are scouring Metro Vancouver’s never-hotter speculative market — not including the realtors who are secretly wholesaling for themselves. Amanda decided to step away from the easy money for moral reasons. She’s most concerned that wholesalers are targeting B.C.’s vulnerable seniors who don’t understand the value of their old homes. She is also worried about offshore money being laundered, and the resulting vacant homes. Because wholesalers are unlicensed, they have no obligation to identify their background investors or reveal the source of funds to Canadian authorities who fight money laundering. Amanda said she believes that unethical and ignorant investors are driving B.C.’s housing market at full speed towards a crash. For these reasons, and with the condition that we not use her real name, she came forward to reveal how wholesalers operate. The calling cards of wholesalers — hand-written flyers offering homeowners “confidential” and “discreet” cash sales — started flooding west side Vancouver homes over the past 18 months. With the dramatic surge in home prices, wholesalers now are spreading into neighborhoods across Metro Vancouver and Vancouver Island. In eight years Amanda has never seen the market hotter than it is right now, and her colleagues are urging her to start wholesaling again. The investor behind the unlicensed broker targets a block, often with older homes, and gives the wholesaler cash in a legal trust. The wholesaler persuades a homeowner to sell, offering immediate cash, no subjects, no home inspections, and savings on realtor fees. While the wholesaler claims to represent one buyer, or in some cases to be the buyer, Amanda said three or four contract flippers are often already lined up, with an end-buyer from China who will eventually take title in most cases. These unlicensed broker deals appear to be illegal. A veteran Vancouver realtor confirmed these types of deals. The realtors we spoke to have been asked by their brokerages not to comment to reporters, so we agreed to withhold their names. According to flyers obtained from across Metro Vancouver and interviews with homeowners who were solicited, wholesalers often say they have Chinese buyers willing to pay a premium for quick sales. Homeowners in Richmond, Vancouver’s east and west sides, Surrey, Langley, Coquitlam, Burnaby, White Rock, Delta and North Vancouver confirmed such offers in interviews. One resident of Vancouver’s west side Dunbar area said she was annoyed by wholesalers constantly soliciting her, and a man in Surrey said his elderly mother was bothered by wholesalers. “A guy walked up and he offered $700,000 cash within a day, and he said I would save on the realtor fees,” said Zack Flegel, who lives near 119th Street and Scott Road in Delta. After the offer is accepted, the wholesaler assigns the purchase contract to the investor for a 10-per-cent markup, Amanda said. But some wholesalers aren’t content with making $100,000 or more per sale. “People were going in and offering, for example, an 80-year-old widow, she bought the house for $70,000 and it is now worth $800,000 and they were offering her $200,000,” Amanda said. “So they are making $300,000 or $400,000 (after assigning the contract). Amanda said her father died recently. She pictured her mother being targeted by wholesalers and resolved never to play that role again. B.C.’s Superintendent of Real Estate, Carolyn Rogers, conceded the potential for elder abuse as reported by Amanda. It is illegal for wholesalers to privately buy and sell property for investors without a licence, Rogers said. She said her officers have approached some wholesalers recently and asked them to become licensed or cease their activities. A review of the superintendent’s website shows no enforcement orders, fines or consumer alerts filed in connection to unlicensed wholesalers making cash deals and flipping contracts. Amanda said that over the past year she learned of new levels of “layering and complexity that I didn’t see five years ago” in wholesaling and assignment-clause flipping. “Five years ago I didn’t see realtors wholesaling, and I didn’t see people calling me so that I would get them a property and not assign the property to them, but work as a ‘partner’ and I would attach a 10-per-cent fee. Amanda said some wholesale deals involve only unlicensed brokers and pools of offshore cash organized informally, and some appear to involve realtors and brokerages hiding behind unlicensed wholesalers. Darren Gibb, spokesman for Canada’s anti-money-laundering agency, FINTRAC, confirmed that unlicensed property buyers have no obligation to report the identity or sources of funds of the buyers they represent. However, Gibb said, if realtors are involved in “assignment flipping” it is mandatory that they and unlicensed assistants make efforts to identify every assignment-clause buyer and their sources of funds. Vancouver realtors confirmed that money laundering is a big concern in assignment-flipping deals, whether organized by an unlicensed wholesaler or a realtor. “When you are a non-realtor broker you no longer have to play by any rules,” one Vancouver realtor said. NDP MLA David Eby and Green MLA Andrew Weaver commented that allegations of unlicensed brokers targeting seniors and participating in potential money-laundering schemes call for direct action from Victoria and independent investigation, because these concerns fall outside the jurisdiction of the B.C. Real Estate Council and its current ongoing review of real estate practices. “It is very troubling to me,” Eby said, “that not only do we have a layer of real estate agents that are acting improperly and violating the rules, but there might be this additional layer who are not bound by any rule and have explicitly avoided becoming agents for that reason. “This unscrupulous behavior is targeting seniors who need money for retirement. What kind of society is that?” Weaver said. This entry was posted in Housing, Housing Market, Real Estate and tagged China, housing bubble, money laundering, Vancouver on March 10, 2016 by Bone Fish.